Sunburn. Photographs by Chris McCaw. Published by Candela Books, 2012. Photographs by Chris McCaw. Text by Allie Haeusslein and Katherine Ware. Candela Books, 2012. Hardbound. 96 pp., 65 color illustrations, 10-1/2x11-1/2". 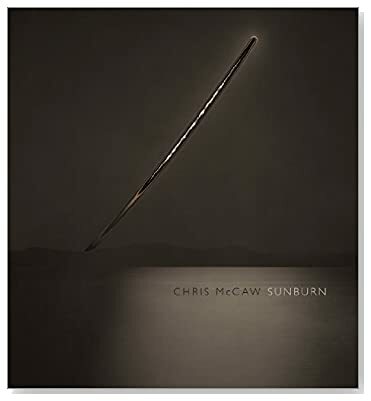 I was both excited and apprehensive to learn that Chris McCaw's photography was being published in his first monograph, Sunburn. I've been a fan of his one-of-a-kind photographic objects for a while now, and was nervous about how the images would translate to the printed page. The physicality of the sun-scorched burn across (and often through) his photographs is integral to the experience and because I've seen the real thing, I was uncertain that someone who hasn't could appreciate what they are looking at. Would the book pull it off? Sunburn, by Chris McCaw. Published by Candela Books, 2012. The answer is an emphatic yes. In fact, the first image in the book is reproduced front and back, with a die-cut "burn" hole through the page, just as the real, silver paper image would appear. You can see the front side as well as the back, complete with McCaw's handwritten title. By starting out this way, the reader is primed to understand the physicality of what they are looking at in the following pages. Although McCaw is using vintage gelatin silver paper, his photographs are anything but simply black or white. There are warm and cold variations of tone as well as the wonderful earth tones (brown, orange, black) caused by the sun melting the silver gelatin and burning the paper. This range of tone and color is beautifully captured in the high quality printing of Sunburn, and even the color of the end papers is analogous to the photographic tones. The images are often printed at the same size as the original image, and everything is crafted so well that it really is the next best thing to seeing the actual photographs. There are two accompanying essays by Katherine Ware, curator of photography at the New Mexico Museum of Art, and Allie Haeusslein, gallery manager at Pier 24 Photography in San Francisco. They are concise, accessible, and informative while illustrating that it is necessary to discuss McCaw's work in the context of the early days of photography (I think of him as a true heliographer myself). This exploration of photography's history is useful for understanding the deeper implications of McCaw's art: he is reaching back into the early days of photo-chemical representation and considering possibilities that had been declared undesirable dead ends for the medium, one of which is photography's reproducibility. McCaw's images are unique objects, much like Daguerrotypes and tintypes, and cannot be printed ad nauseum. But he is also relying on very contemporary ideas of art. The act of making each photograph is very much a performance or happening, and as Haeusslein points out, the disregard for the integrity of the surface and material could only have been explored in the contemporary era. DAVID ONDRIK has lived in Albuquerque since the late 1970s. He was introduced to photography in high school and quickly appropriated his father’s Canon A-1 so that he could pursue this exciting artistic medium. He received his BFA, with an emphasis in photography, from the University of New Mexico and has been involved in the medium ever since. Ondrik is also a National Teaching Board.